The role of unit hydrograph theory in the flood prediction process is to provide an estimate of streamflow that results from a given amount precipitation. A unit hydrograph shows the temporal change in flow, or discharge, per excess unit of precipitation runoff. This module offers a thorough introduction to the use of unit hydrographs and the application of unit hydrograph theory in flood prediction. 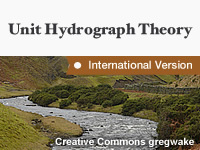 Key terminology and assumptions, the process of creating a unit hydrograph and application of unit hydrograph theory to forecast situations are all explored through comprehensive animations and interactions. I enjoyed this lesson. I thought the animation were very helpful, but I know I am a very visual thinker and learner, so I would have enjoyed more of them, more videos, or more real life case studies to relate the topic back to. Very good lesson on Unit Hydrographs. Would like to see some number examples of data sets used to develop unit hydrographs. This lesion is very important of Hydrologist Section . This Lesion is good Hydrology Division of DMH. In this week lesson is very useful. I got a lot of knowledge. This week lessons, I got the new knowledge and experience. It's useful for me and for my department. Excellent experience of learning.as usual highly knowldge packed module.Thank you to all. very nicely described the study materials. this module is thorough-researched and detailed,very interesting! This module was very good and in detail. I could clear my doubts through module. The lessons increased my understanding of the topics & how the content was relevant to my work. As a mechanical engineer, I didn't have much idea of unit hydrograph theory. The module is designed and presented well for a basic understanding of the subject. Thank You. Unit Hydro graph theory explain in simplified manner, which is very difficult.